It was gloomy in Baltimore the morning of April 27. But that didn't stop the crowds from coming to the greatest race on the east coast. 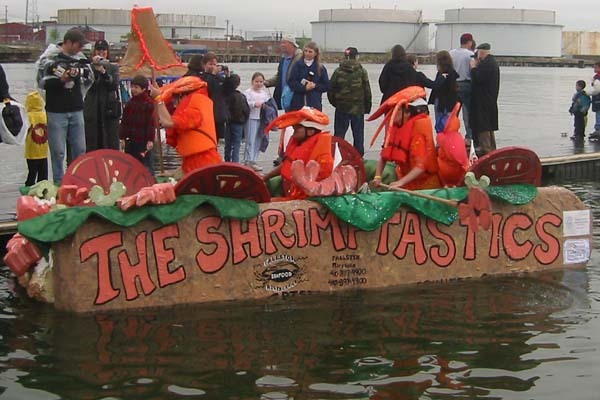 The number and creativity of competitors gets better every year, and rain couldn't dampen that spirit. The weather improved as the day progressed. Here are pictures if you were foolish enough to be somewhere else, and memories if you were clever enough to be there. Since the first amphibians crawled out of the slime, development toward this day's frivolous delight would have been suitable inspiration for the effort of those 3 billion years. Her new Indian Elephant is a masterpiece! "Bumpo" comes complete with a waving Mahatma Gandhi made of pantyhose on top. This is the only sculpture I've seen with a roof hatch allowing a pilot to climb out on top (to share the saddle with Gandhi). 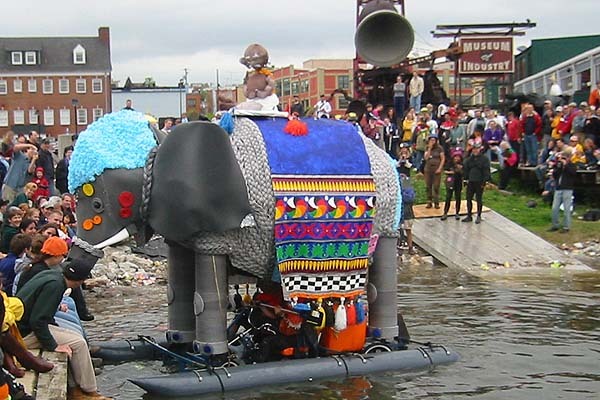 During the second water course near the Museum of Industry, Bumpo went off course, but her pilots took advantage of the situation and started schmoozing with the crowd using her remote-controlled trunk. 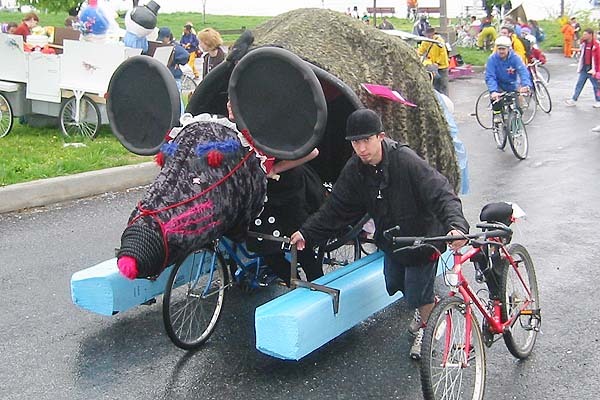 The only problem was that the elephant requires a huge amount of time to reconfigure between water and land riding, and is so big it held up the race interminably while pontoons were inflated and ratcheted into place. Bumpo received the well-deserved People's Choice and Sock Creature of the Universe for its sock puppet that all sculptures are required to carry. This teapot from the Mad Hatter's Tea Party from Alice in Wonderland was the most amazing new sculpture this year. The Queen of Hearts is seen here peering out to steer, while the giant teaspoons paddle the craft along. The whole crew was dressed up as characters from the party. Not surprisingly, they won the award for Best Costume, and also for Best Bribes. This large craft was amazingly maneuverable in the water, turning on a dime; I have no idea how they controlled it so effectively in the water. This spouted delight comes from The Make Believers, the same folks who constructed 2002's amazing "Stomp in the Name of Love" sculpture propelled by Kinetinauts' grape-mashing motion which had the most novel propulsion technique I've seen at any race, and this teapot shows the same attention to detail. For instance, you may be able to see that the round porthole flaps they used to cover the spoon-holes were painted on both sides to match the bright teapot motif. Lewis Carroll would be proud. The police were hot on the trail of Louie's Bone Wagon, the gorgeous dog sculpture, which did an amazing job of capturing the canine spirit. The head and tail were semi-rigid and bounced jubilantly, and the expression on its face is priceless. This was the work of Eli and David Hess, and won the Engineering Award. This sculpture celebrated the wedding of two Baltimore commercial foodstuff icons--the one-eyed National Bohemian beer man, and the similarly round-headed Utz potato chip girl. 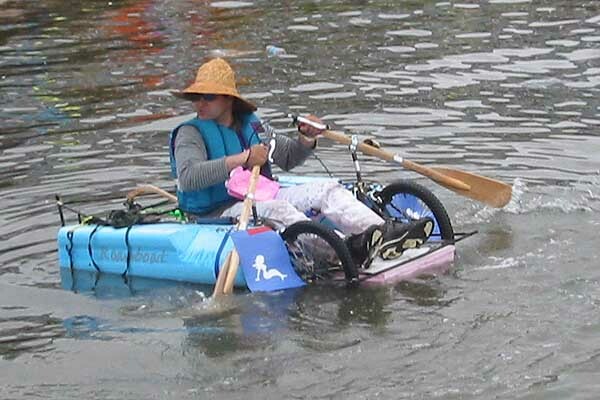 On land, two mountain bikes were attached by wooden strips to the trailer; in water, the bikes were fastened to the trailer and paddles propelled them. This culinary romance is the creation of Cindy Willow and Jennifer Haines of the University of Maryland. The "SARS Patrol Team" had this peculiar design with its two pilots facing backwards, making steering a challenge. 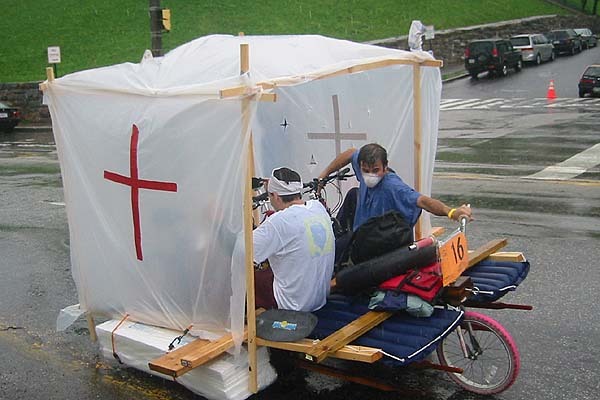 While the design was implemented on an unlavish budget--air mattresses, unadorned blocks of styrofoam, and a rickety frame of wooden sticks--they made it all the way through the race and won the Next to Last award. By Jay Gelman and company. Bulldog Seeks Bone was built by students at Kennedy Krieger High School. One pit crew member skateboarded the entire race. Minnie chased a bone made of girder toys held in front on a long pole. As a bush-league entry, it did not enter the water. A Frank Lee production. 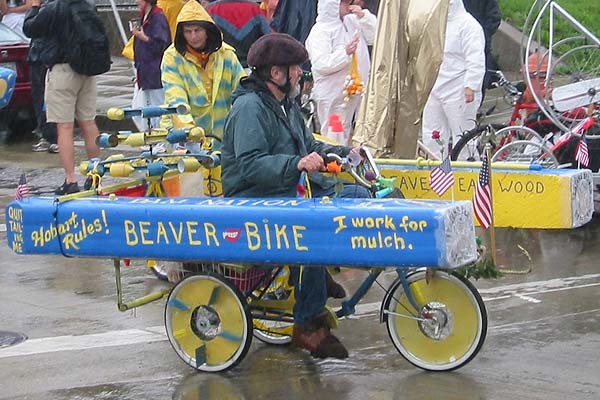 Jimbo Hansson—the beaver guy—was back, but the rain prevented him wearing the Beaver Costume that was to be the piéce de rèsistance of his sculpture. 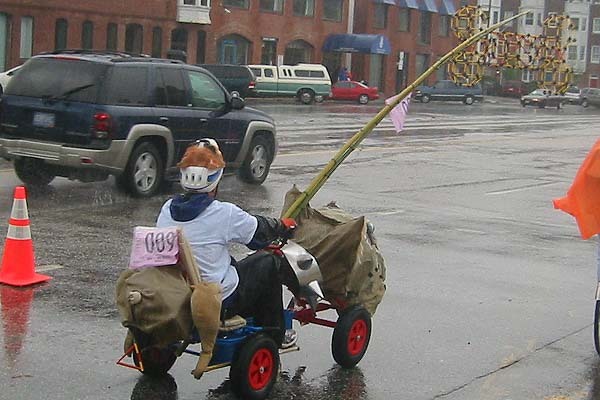 Without its encumbrance, he did, however, win the Speed Award for finishing the course fastest. Be sure to check out the previous two years' beavers on the links at the top and bottom of this page for examples of his past creativity. 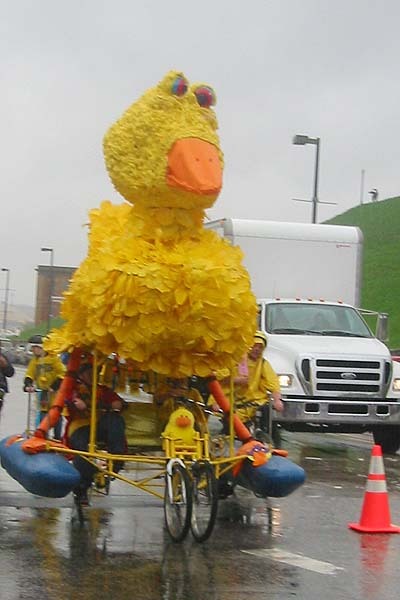 Daley, the giant amphibious duck, was escorted by a crew of young students from the Catholic Community School, who biked along the entire course like ducklings. They won the awards for Best Pit Crew and Spirit of the Glorious Founder. Note the miniature duck just above the front wheels, configured to look like it was steering. Unlike most ducks, Daley wears pontoons. 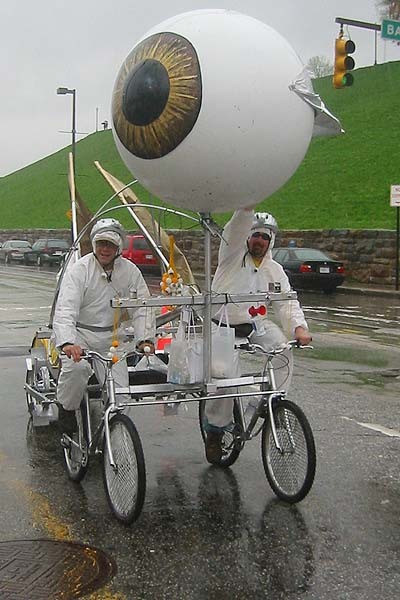 This bold giant eye unfortunately didn't survive long into the race, so Mike Peters and the rest of Team Eyeball were left driving an odd shiny aluminum contraption lacking its most dramatic component. 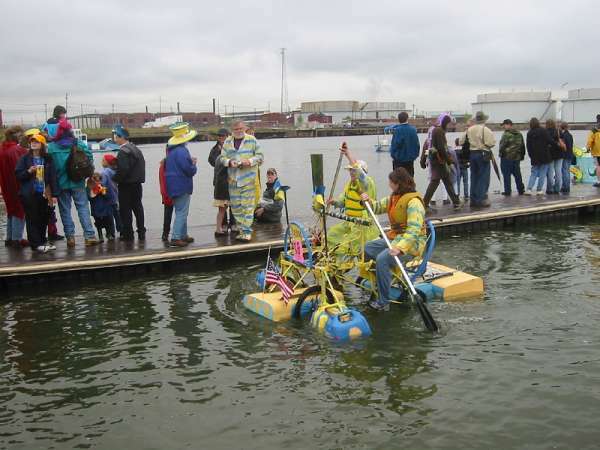 These Hillbillies used the PVC-pipe pontoon strategy that had proven disastrous two years earlier for another competitor who immediately sank. On this sculpture, though, the pipes were fastened more securely, and they navigated land and sea with festive matching outfits. Note the explosion-of-feathers creature perched atop the sculpture. We found this pitiful statement of irony lying in the gutter--a soggy cardboard sign that had fallen off a sculpture suffering in the rain. 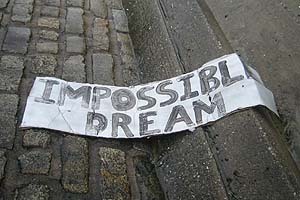 However, in the greatest Don Quixote spirit, James Vorosmarti & company pulled their Impossible Dream sign out of the gutter and refastened it to their sculpture. 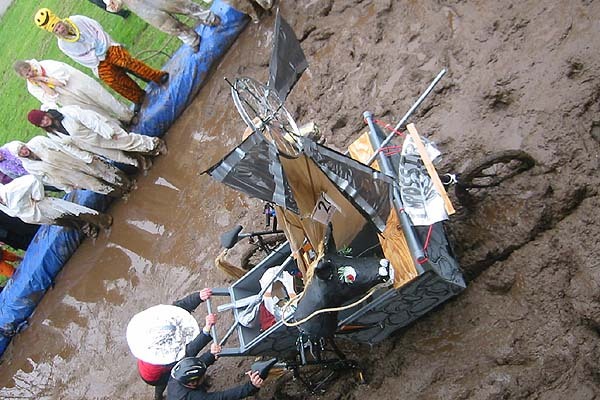 During the race, their windmill lost one of its vanes, they took on dozens of gallons of water in the water course and looked in danger of sinking, and you can see how hard they had to push through the mud! But they persevered and finished the race. No matter how hopeless, no matter how far. The mud this year was too thick and deep--not a single sculpture made it through under its own power. In previous years, a few especially well-designed vehicles were successful, but this year they had a foot thick of solid mud was too much for even the best design to slog through under its own power. The mud sucked off folks' shoes, and people were diving into it--until one boneheaded teenager ran all the way through the mud and dove into its shallow edge at the far side, smashing his head into the pavement two inches down and requiring ambulance attention. 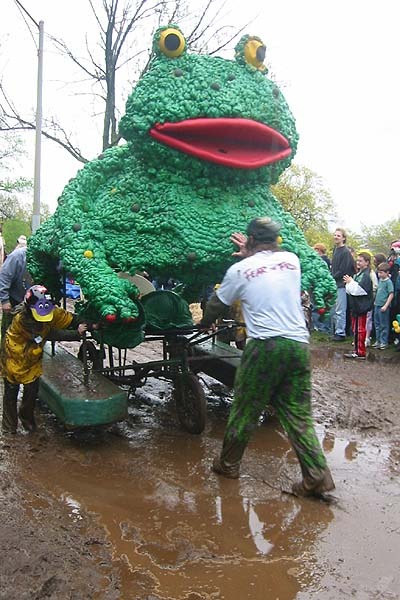 The frog returned for a second year; despite its amphibious nature, it required as much pedestrian-assisted pushing through the mud as all the others. 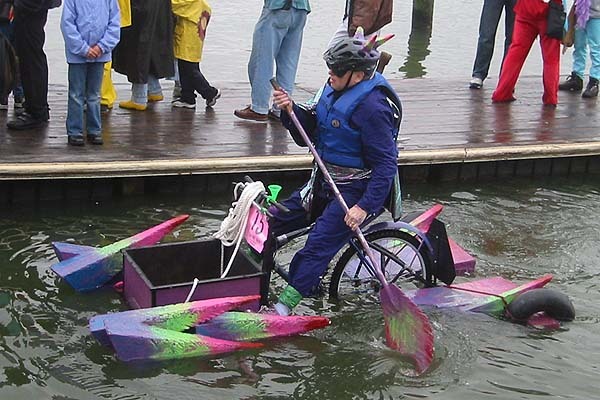 Rowlando piloted this Roadboat vessel, complete with mermaid mud flaps. He suffered an early breakdown, which was too bad because he designed it so he could propel it on land by rowing like a rowboat. 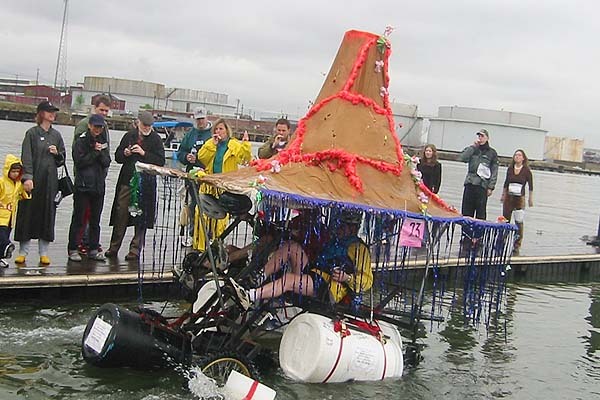 His sculpture couldn't continue on land, but the kinetinaut continued undaunted in the water, and won a Golden Flipper award for having the most interesting water entry. 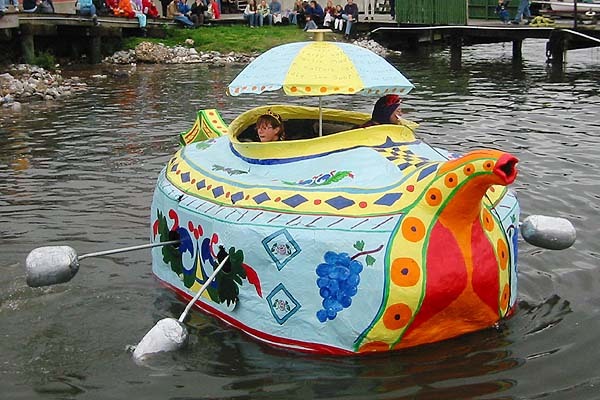 He promises to return in 2004 with an improved Roadboat. Jim Paulsen's superhero vessel had a matching paddle. During the mud section, he got stuck like everyone else. But where they really stood out was when he and a member of his pit crew ran a rope through the metal loop at the front of his sculpture, and tried to pull it out. Since the rope wasn't actually tied to the sculpture, but was loose through the loop, they began a vaudeville comedy routine--they'd almost synchronize their heaving, but over and over again one of them was a second or two behind the other, so they'd alternately heave at the slack and at the other person's grip, rather than pulling the sculpture forward. After quite a few tries, they finally got synchronized enough to pull the sculpture onward. This cute rat struggles up the hill after the first water entry, but was at home on land and sea. Their shirts read Equipe du Rat. 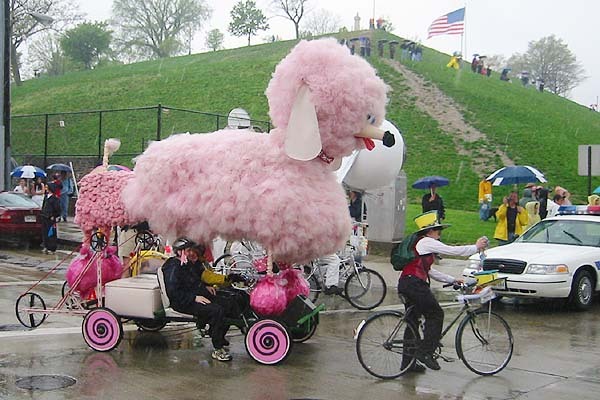 This most artistic of one-person crafts was created by Theadora Brack; Drew Shelton assists in the uphill climb. This sculpture called "Bedlam" won the Grand East Coast National Mediocre Champion award for finishing in the middle. 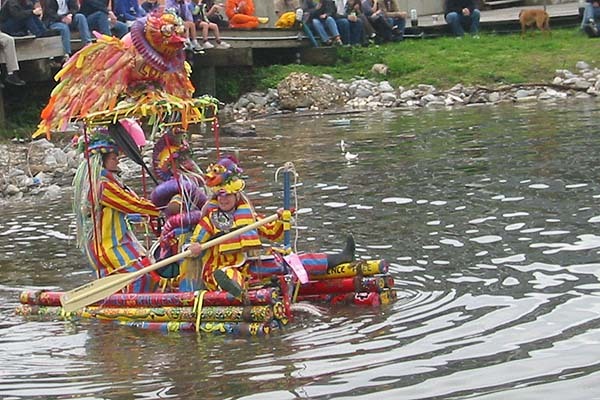 It's created by Bobby Hansson and Bill Lepley of Chloe Fabricating, in Punxsatawney, Pennsylvania, with Maggie Creshkoff and Jan Loney rowing. 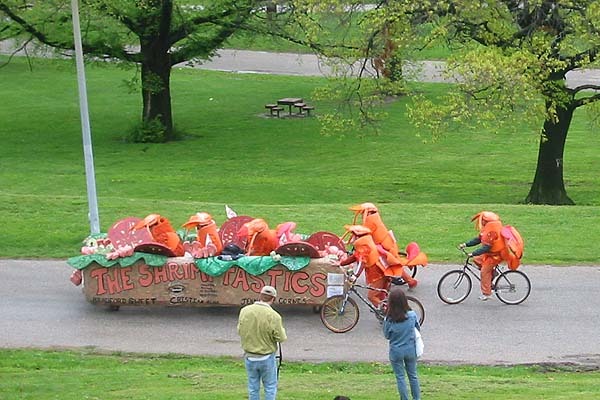 The Shrimptastic float from Towson University was exquisitely detailed, including fabulous shrimp costumes for the pilots and support-shrimp on bikes. 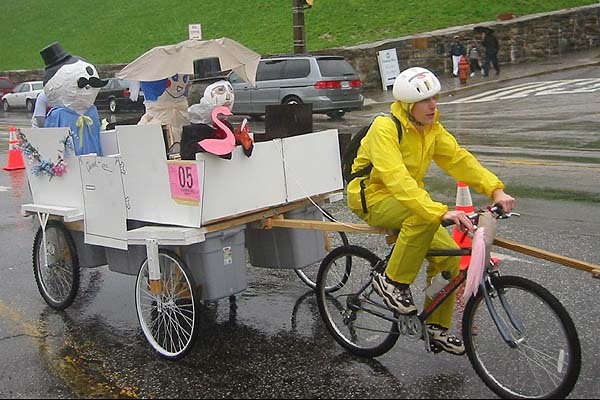 Like the teapot folks, these guys definitely know how to make an artistic statement in the Spirit of the Race. They won the Pilot's Choice award. This volcano started the race with smoke billowing from its cone, but the early downpours quenched its fuming. Nonetheless, this great hunk of creativity survived the water courses admirably, and had a particularly easy time driving into and out of the water. Jeff and teacher Phil Brauer of Carver High School in Towson created it. 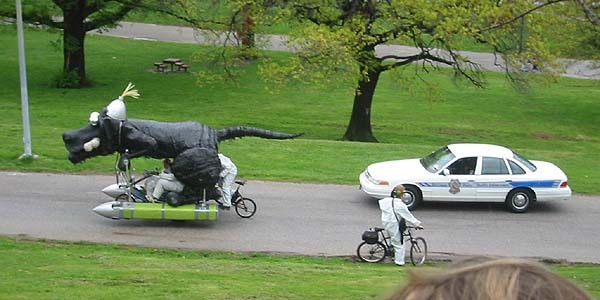 There was also a Dragon of Death in the race, but I somehow managed to inadvertently not take any photos of it. The photos on this page were also featured on Slashdot and Wired simultaneously.